These images are best viewed using the SLIDESHOW tab to the extreme right of your screen. They were uploaded as large files so that the extraordinary intensity might be visible. Without using SLIDESHOW you won't be able to see just how lush the scenes really are--and the images are still a very long way from the reality. 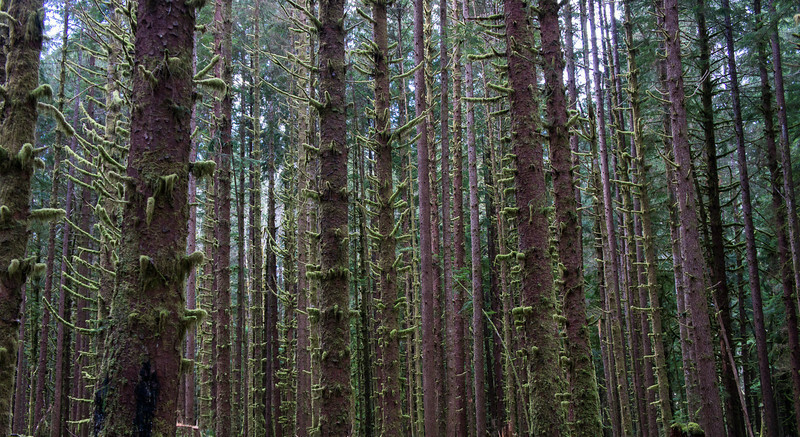 The trees in these forests are predominantly Douglas Firs, Sitka Spruce, Cedars, and Hemlock. There are also some Big Leaf Maples. The Cedars, which often entail multiple trees growing together as a single entity, are astoundingly large and assume bizarre shapes. For comparison's sake, have a look at the gallery "Enchanted Forest" in this Travel Category to compare these images with my short trip to the Humboldt Redwood Forests in California.